So we lost our keyword data. Now what? What does life look like after not provided? 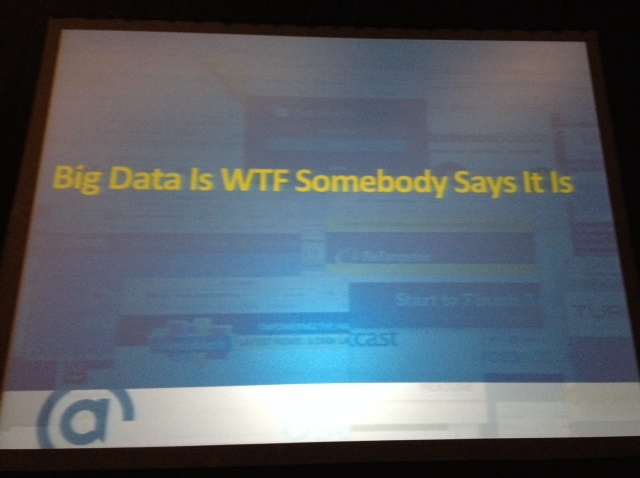 This session is all about gleaning insights in a post-(not provided) search industry. Benjamin Spiegel (Director of Search Operations, Catalyst) kicks it off. What is Not Provided and What Does it Mean? In 2011 Google started to encrypt search. HTTP changed to HTTPS and consumers probably didn’t notice much of a physical change, but marketers have since been noticing big changes in GA reporting data. Pre-2011 if a searcher were to navigate from the search engine to a website, information was passed directly from the engine on to the end website giving web masters rich GA data about search queries and referral traffic. Now… that is gone. Organic optimizers have basically lost the connection between the term and the activity on the site. (The connection between the term and the activity on the site (Keyword → landing page → activity). 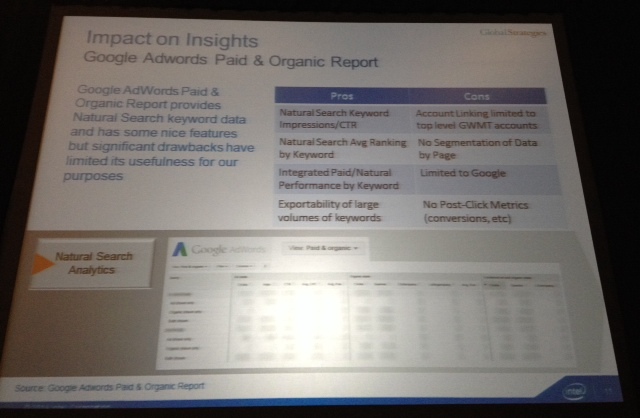 Paid marketers have limited access to this data, but organic optimizers cannot access this data in Google Analytics. 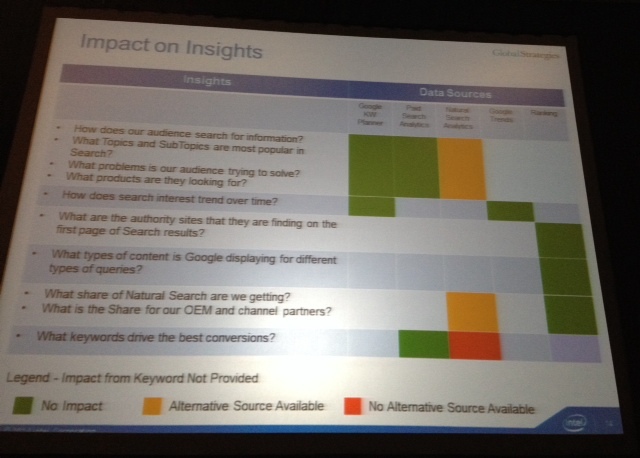 That said, this doesn’t mean you can’t access actionable data that will allow you to glean insights from search traffic (as Benjamin and the other presenters will discuss throughout this presentation). 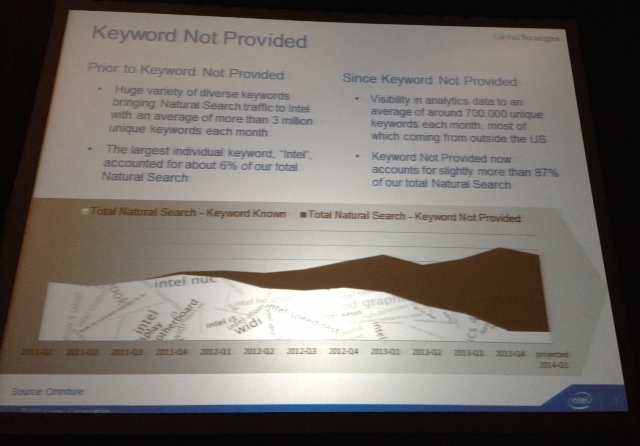 In a nutshell: Keyword data (and anything (not provided) is not coming back. Don’t hold your breath. You cant buy it, there is no substitution, and….. it just doesn’t really matter that much anymore. Google is about relevance, content, and context, NOT key phrases. Coupon vs. Coupons vs. Couponing; it doesn’t really matter. 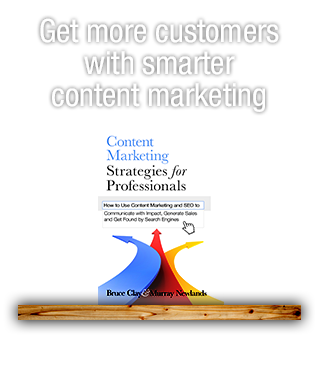 It’s all about context anyway and keyword data never really lead to action anyway. Catalyst (Benjamin’s parent company) is using option B, the Google Python solution. Bruce Clay, Inc. uses option A, the Webmaster Tools API option. What day of the week are my consumers most interested in X head topic? How does CTR change based on day of the week? Does activity for X head topic differ for branded CTR versus unbranded CTR? You can find all of this information in GWBT. (In GWMT make sure you’re looking at Pages rather than phrases). Marty’s going talk SEO metrics, how to leverage Big Data, and what can you do with third-party big data to calculate/translate action. 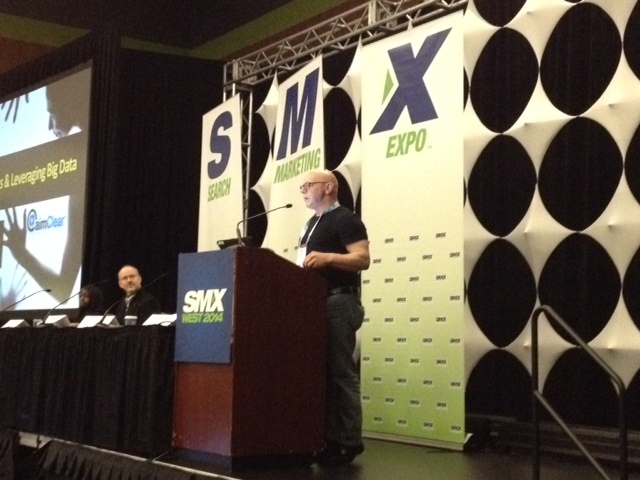 “SEO measurement is actually better than before we lost keywords,” says Marty. 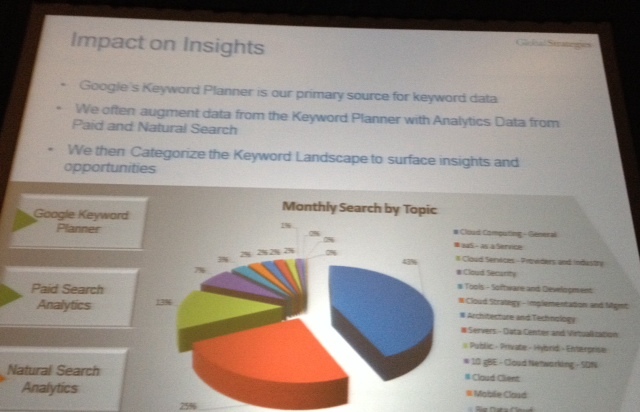 He says he’s seen no loss from clients not being able to granularly analyze keywords. Post not-provided a lot of organic keyword insight is coming from paid tool manufacturers like SpyFu (which, by the way, has been historically considered a PPC Competitive intelligence tool). Remember: All data is just a bunch of junk if you don’t ask any good questions; if you don’t take your data and turn in into insights. Ask yourself: How much organic conversion am I seeing and how am I doing at the asset level? What does my traffic share look like? How does overall traffic conversion weigh against conversion? Next are two speakers from Intel Laura Ann Mitchell and Ken Shults. 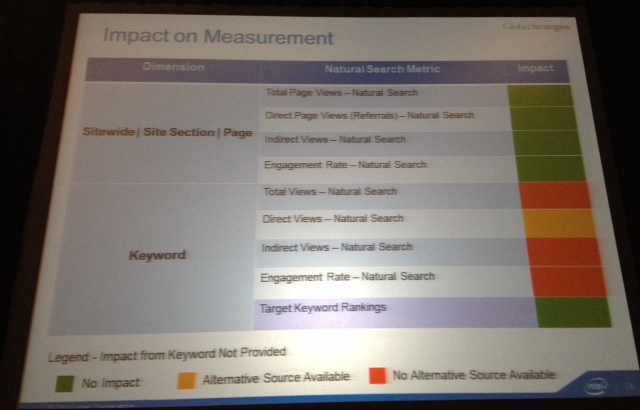 Prior to keyword (not provided) Intel had a huge variety of keywords brining natural search traffic to Intel (apx. 3 million universal keywords per month with the navigational query “Intel” accounting for about 6% of our total Natural Search traffic). Since Keyword Not Provided visibility in analytics is significantly decreased but consider themselves only “slightly irritated” on the Pain and Suffering/Impact scale. 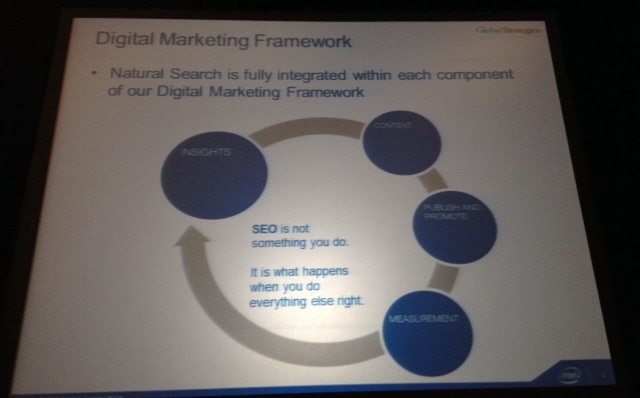 Natural Search should be fully integrated within each component of the Digital Marketing Framework . 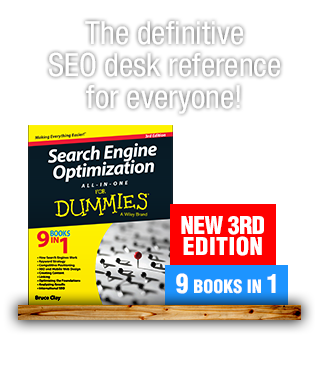 SEO is not something you do, it’s something you do when everything is done right. It should be a part of your whole digital marketing framework, not something that stands alone in it’s own silo. Want to glean data post (not provided)? 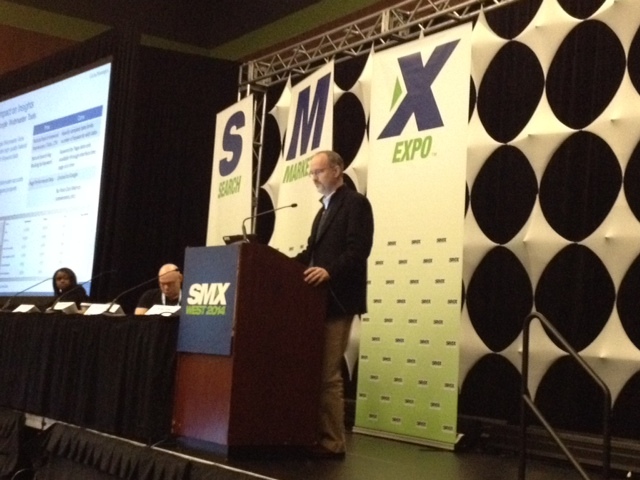 We need to reverse our model; not look at keywords, but look at optimization at the page-level. Search helps us better understand out audience. (What are their problems? What are they searching for? What are they trying to solve?) Intel utilizes insights from search to inform multi-channel marketing including content, paid search, social, display, and retail channel support. 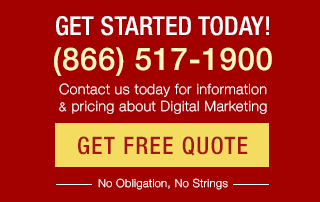 – Google Keyword Planner is their primary source for keyword data. – Data from the Keyword Planner is augmented with analytics data from Paid and Natural Search, and then that data is categorized into a “monthly search by topic” system to better surface insights and opportunities. An opportunity vs. Performance Gap Analysis is performed. Integration of Paid and Natural Search performance data against a categorized keyword/topic backdrop begins to reveal gaps between opportunity and performance. 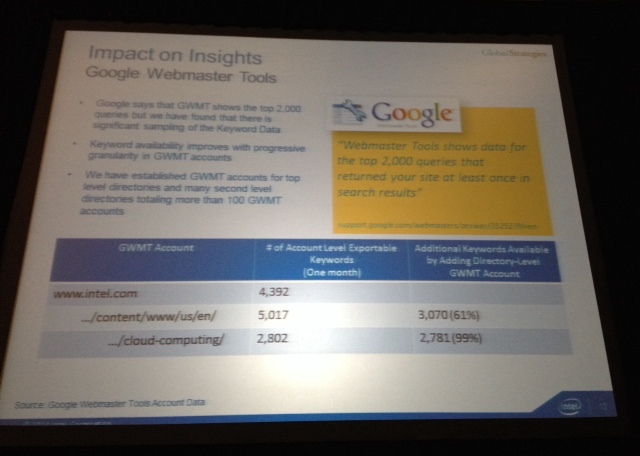 Keyword availability improves with progressive granularity in GWMT accounts. For this reason, Intel has established GWMT accounts for top-level directories and many second level directories totaling more than 250 GWMT accounts that align with different directories. – Do more of what’s working! Several years ago Intel shifted from keyword-centric reporting to asset-centric reporting to better align with stakeholder’s goals. Their asset-centric reporting style means their measurement plan always begins by defining a narrow site section of interest and then using that narrow site section as the focus of performance reporting. They do it this way because direct and indirect views of defined page groups of pages give stakeholders a more complete picture of the impact of Natural Search. Trended Views by Page help them uncover stories to explain performance and guide deeper investigation. Engagement data at the Page Level helps them refine content and optimization in alignment with the interests of searchers. 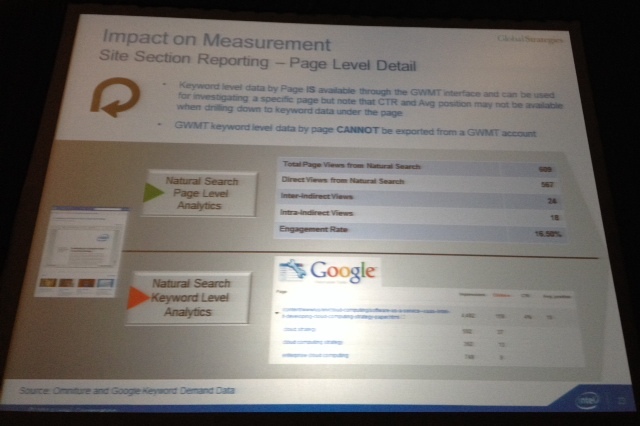 Aligning GWMT sites to allocated Site Sections provides keyword-level Natural Search visibility data, but we do lose Keyword Engagement and Indirect Views data. Keyword level data by page is available through the GWMT interface and can be used to investigate a specific page (but note that CTR and Average Position data may not be available). Intel utilizes the BrightEdge Platform to have data from Web Analytics, GWMT and their target keyword ranking data all integrated into a single integrated environment that facilitates analysis. 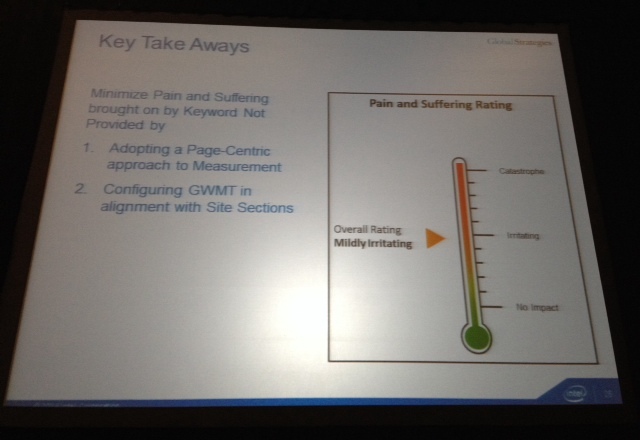 Minimize paid and suffering brought on by keyword not provided by adopting a page-centric approach to measurement and configuring GWMT in alignment with site sections.